"If graffiti changed anything - it would be illegal" says a new statement by what is believed to be a new artwork by Banksy. A campaign has been started by a Camden councillor to have the latest Banksy artwork in Fitzrovia preserved. The mural is on the side of a building under the control of neighbouring Westminster City Council and a number of local people fear that it will be treated as graffiti and removed. Camden councillor Adam Harrison who lives in Cleveland Street less than a hundred metres from the artwork has today (Saturday 30 April) started an online petition and is encouraging people to support his campaign to save the mural. “Graffiti is obviously not something I would normally condone. Indeed, I have alerted other councillors when I have spotted graffiti to help them get it removed. Location does make a difference: graffiti on a listed building would be wholly inappropriate,” said councillor Harrison. “However, this appears to be a Banksy and it is located on a wall which otherwise appears to be of no special aesthetic merit. Arguably, the Banksy improves the wall, and would be a boon to Fitzrovia as an area to have this piece of Britain’s cultural heritage preserved. Fitzrovia itself is also already known for its wall art, such as the murals on Goodge Place and at Whitfield Gardens,” he said. Most local people have expressed a fondness for the artwork. 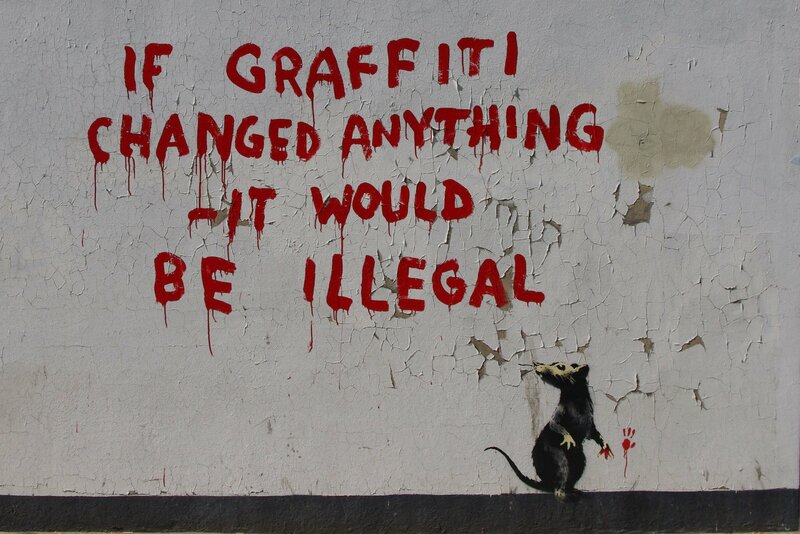 But in 2008 a Banksy mural on Newman Street in Fitzrovia was removed by Westminster City Council. Fiona Green who lives in Fitzrovia fears that this latest mural will receive the same fate. “Banksy is the man of our times : his bold statements represent the views of the silent majority, which is why he prefers to remain anonymous. We ignore or destroy them at our peril,” said Ms Green. “This work is witty and apposite. We allowed the removal of the last Banksy without opposition, we must not allow this one to face the same fate. With the Games upcoming in 2012, the work will be a crowd pleaser in Fitzrovia, in the same way that all our other murals are,” she said. Councillor Harrison is now urging people to sign the petition. “The building owner and Westminster City Council should take steps to preserve this piece of urban art, left here by an internationally recognised artist who is now part of Britain’s cultural fabric,” he said. In 2008 councillor Robert Davis of Westminster City Council said that Banksy’s One Nation Under CCTV mural should be removed because it was not authorised and should be treated like any other graffiti. “I take the view that this is graffiti and if you condone this then what is the difference between this and all the other graffiti you see scrawled across the city? If you condone this then you condone graffiti all over London,” said councillor Davis speaking to BBC News in 2008. Some residents living near the mural in Newman Street also objected to the mural as it was drawing crowds of people from nearby Oxford Street. Fitzrovia is administratively and politically divided. The western half of the neighbourhood is under the control of Conservative Westminster while the eastern half lies in Labour-controlled Camden. While Westminster has taken a hard-line against Bansky, Camden has been far more relaxed and a number of his murals have been tolerated. This intervention by a Camden councillor which makes an appeal to his Westminster counterparts is likely to stir up a bit of political debate as well as discussion about art and graffiti. No doubt Banksy will laugh at the irony of his own words being debated over by local elected representatives. Fitzrovia News contacted one of Westminster’s Conservative councillors and the leader of the Labour group on Tuesday for their opinions on this latest Banksy, but so far they have been unavailable for comment. While this latest Banksy mural drew a lot of attention locally and from the United States, there was little media coverage in the London or national press. Since Fitzrovia News published the story within hours of the artwork appearing, virtually no UK newspaper, except the Camden New Journal, took an interest in it. Fitzrovia News was contacted by the several online newspapers to reproduce our photographs, and many blogs copied them. Others sent photographers down to Fitzrovia. But most of the interest was from overseas, particularly from California. Is Banksy not newsworthy in the UK? Or did the build up to the royal wedding take up too much of journalists’ valuable time? Other murals: Mural on Fitzrovia Neighbourhood Centre; The Fitzrovia Mural in Whitfield Gardens. Why preserve ephemera whose ultimate power depends on survival against odds? Banksy laughs, and so does the Dalai Lama. Do you know what lies below his palimpsest? “Call your Mum”…. Fitzrovia is steeped in history and heritage…. and this is part of it. It needs to be saved.